Scientists have created a new material called diamene, which promises to be as flexible as tin foil but hard enough to stop a bullet. The study, led by Advanced Science Research Center (ASRC) at The City University of New York (CUNY), was published in Nature Nanotechnology. It showed how two layers of graphene (each one-atom thick) could be used to make a diamond-like material upon impact at room temperature. There are potentially many uses of such a material, from water-resistant protective coatings to ultra-light bulletproof armor. Diamene is soft and pliable until pressure is applied, when it becomes much more rigid. So if the diamene is shot by a bullet, for example, it would prevent it passing through. It was first theorized using computer simulations in this study. Then, an atomic force microscope was used to apply pressure to two-layer graphene, finding an agreement with the calculations. 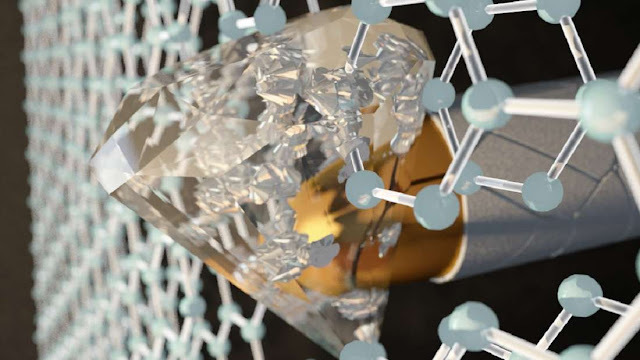 Interestingly, the graphene-diamond transition was found to only occur with exactly two layers of graphene. Any more or less and it didn’t work. Graphene is the “miracle material” that was essentially first discovered back in 2004, made by stripping graphite into single layers of atoms. Since then scientists have proposed a number of novel uses for the material, from clean energy to night vision lenses. Now, body armor can seemingly be added to the list.